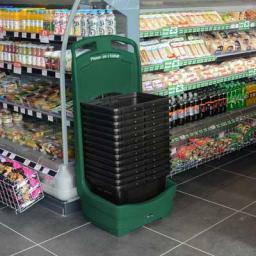 The Glasdon Mobile Basket Buddy has two rear-mounted wheels and integral handles, ensuring the unit is easy to move around the store. A unique basket grip attaches to a stainless steel rod in the back of the housing and clips onto a wire basket (an extension strap is supplied for use with plastic baskets) to secure a stack of baskets to the unit before moving. The Mobile Basket Buddy is made from self-coloured Durapol® Material, with a smooth, easy-to-clean surface that requires minimal maintenance. Durapol Material will not chip or rust and never needs painting. 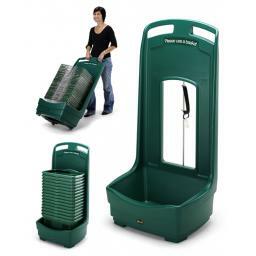 The Mobile Basket Buddy's base is designed for optimum stability while taking up as little floor space as possible. The unit will display plastic or wire baskets and has an integrally moulded 'MAX' mark to indicate the recommended maximum height of baskets.